Magento 2 Hide Price extension hides the product price and "Add to Cart" button for the customer groups and categories to provide personal approach & organize private sales in Magento 2 stores. Hide product prices for customer groups. Hide prices globally, category specific or product specific. Hide "Add to Cart" button. Set custom text to replace prices with. The pricing policy you follow for your E-commerce business impacts the sales. Your business may need to organize private sales; where not logged in and guest users would not be able to see the product prices. Such tactics encourage the visitors to sign up or login and offers the personal approach to specific users which is good for the store! Meetanshi offers Magento 2 Hide Price extension to help the store owners hide product prices and also the "Add to Cart" button for particular customers groups and categories as configured by the admin. 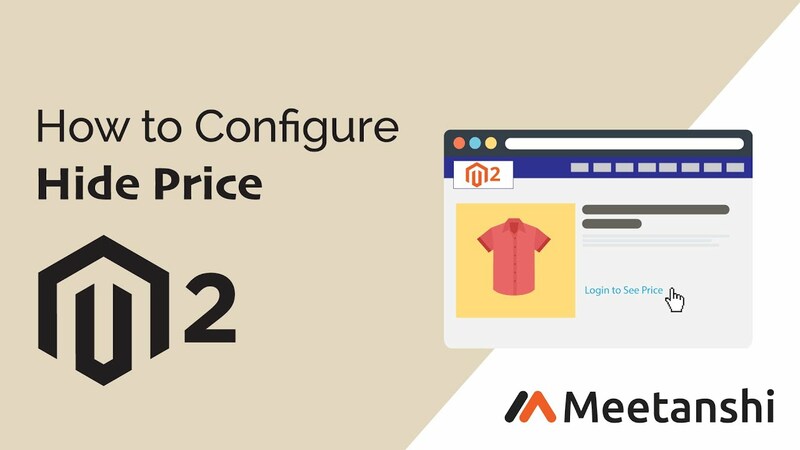 Magento 2 Hide Price extension by Meetanshi helps to easily manage the price display. Facilitates the price details and "Add to Cart" button only to the specific customers' groups based on set configuration. Admin can also set an HTML code to hide prices with the text like "Contact for Price" and redirect users to a particular page to invite contacts. This exclusiveness to privilege customers helps in maintaining client relationship and prompt other visitors to have those advantages by upgrading their account. The module has many more advantages such as allowing the store owners to decide the price according to the business needs, remove the prices for all categories, not allowing a particular customer group to add products to wishlist or redirect the users on click of "Add to Cart" button to the registration page, etc. Hide the price and "Add to Cart" button on any category and product of the store. Select specific or all categories when you select category specific scope. Also, select specific products and enable hide price for each by navigating to Catalog > Products > Product Edit > Hide Price tab. Product prices get hidden for the wishlist and compare pages as well. Useful for my Magento 2 store! Allows me to decide the prices based on my business needs! If you! like something new? Look at this page. Only there the choice of girls for every unique guy and completely free! They are good slaves, they will do everything you say ! Excellent hide price extension for my store! 1.0.1 Added different scope to enable hide price for.